Rotary tables are used to improve productivity in machining, fabrication and production. The idea behind this machine tool is to be able to quickly and easily rotate the work piece placed on the table. This changes the position of the work-piece around a fixed axis to drill, cut or grind the part at specific angles. Some rotary tables enable indexing operations as well. Have these simple yet efficient machine tools been under appreciated, even taken for granted? Before the rotary table became commonly used in metalworking shops and facilities, parts were placed on a flat surface and were adjusted manually during the manufacturing processes. This was very inefficient and much less accurate. Even the very first, most basic rotary table allowed parts to be easily rotated, taking less time and effort for machine operators. Use of these tables in combination with mechanically operated machine tools did improve due to the fact that the part could be centered at the central axis of the table. However, there is room for operator error. This is where computer numerical controlled machines and rotary tables have become a perfect fit for one another. Rotary tables are very versatile and can be used manually to perform drilling, welding and various other machining operations by hand. However, they are most efficiently and accurately used in combination with other machine tools, especially CNC machines. CNC machine tools are commonly equipped with horizontal or vertical rotary tables depending on the style of machine. These machines can precisely control the positioning of the part in reference, to the tooling being used to perform various machining functions. The distance from the center of the table and the cutting tool is measured and used as a reference to know where the work piece is in relation to the cutting tool at all times. Concentric machining can be accomplished by changing the distance of the cutting tools from the table’s center in the X-axis or Y-axis directions. More complex angles and curves can be machined by eccentric placement of the part to be a specific distance from the center. 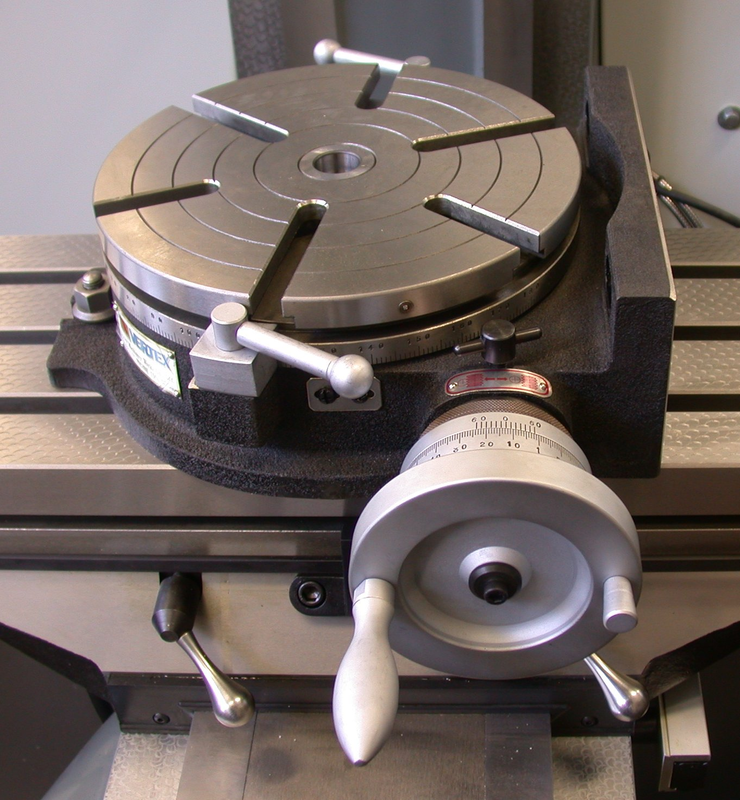 Cutting of arcs with the addition of a compound table on top of the rotary table allowing the operator to position the center axis anywhere on the workpiece. Also, many parts can be manufactured on a CNC mill with tail stock that would typically require a lathe when the rotary table is converted to stepper motor operation. The bottom line is that a rotary table can and will improve a machine’s efficiency and accuracy. Even manual cutting, welding and grinding operations can be greatly improved with the use of the proper rotary table. Underrated and underappreciated, these machines will boost your industry’s productivity. Take it from me, I got them and efficiency and accuracy in metalworking went up.